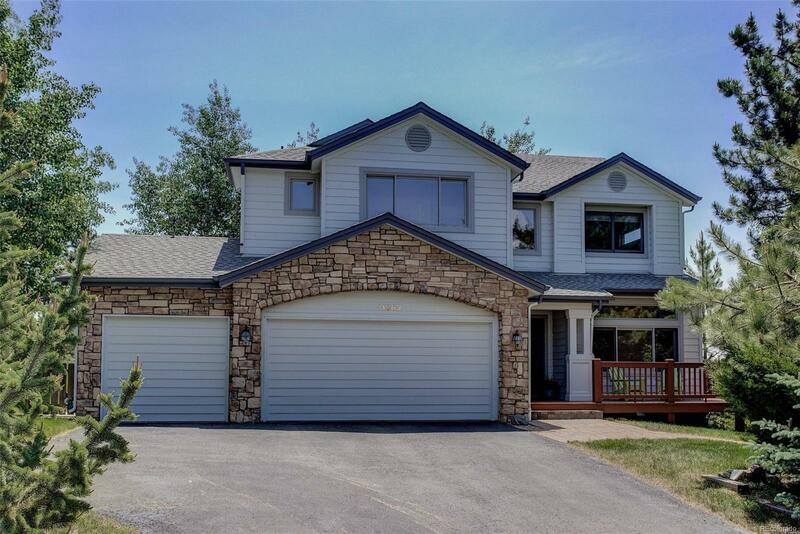 Enjoy mountain living at its finest in this gorgeous home on quiet cul-de-sac with mountain views from every window. Ideally situated next to open space & a short walk to rec center, restaurants, schools & Elk Meadow Park, this lot is one of the best in the neighborhood. The home has room for all with 4 bedrooms & 3 baths upstairs & a mother-in-law apartment downstairs with full 2nd kitchen, bedroom, bath & family room. The main floor includes an eat-in kitchen with 2 convection ovens & gas range, dining room, office, great room & living room while the high ceiling downstairs has a large rec room with fireplace, room for a pool table & walk out to a private patio with hot tub. Gleaming hardwood floors throughout main level, beautiful granite counters & rock fireplace add to the mountain elegance. Relax in a hammock on the covered deck soaking up magnificent views, watch the elk graze in the adjoining meadow or jump on a bike & hit the trails nearby. New paint inside & out.